It’s an unsettling feeling to be gazing out on Holy Week from the perspective of a pastor and not feel the…hype. In some ways, this is the Super Bowl for pastors. Lots of new guests and friends often join us for worship gatherings around Easter. We’re expected to have something new and entertaining and funny (it’s April 1 this year!) and meaningful and brief to say. There are Easter egg hunts, candy, new dresses, alleluia’s, lilies and sometimes even petting zoos. So to stand at the beginning of Holy Week, the last week of Jesus’ life, and to feel eerily calm is a bit uncomfortable. Until I started to unpack that a bit. I sat with the feeling and it didn’t take long. Last year, I shared a deeply personal message. That was an incredibly meaningful Holy Week experience for me. I was going through my own life-changing resurrection. Holy Thursday, Good Friday and Easter morning literally woke me up to a new life. Of course this year will feel different. The Holy Week rhythm is now my normal life. Every single day. The celebrating of Palm Sunday. Jesus rides into the city celebrating a different kind of king and power than the world wanted. I feel the joy of new realities and the freedom of a God who’s never exactly who I think God is. The anger of Table Turning Monday. Jesus is angry with what the Temple has become. He interrupts injustice. I feel the anger when I watch our corporate life together and what some of it has become. I feel the anger when I observe my own life and see places that are dry, empty, self-sufficient and almost dead. The breaking of bread on Holy Thursday. Something in me breaks open in the best way possible. A white flag is raised. An old steel door creaks open just a bit. A strong wall cracks. The grace starts to get in. The dying of Christ on Good Friday. Something dies in me that needed to die. My pride, an old tired way of thinking, an old dream, an annoying habit, a way of seeing the world or another person. Something that kept me from coming back to life. The rising of Christ on Easter morning. Then the freedom appears. It’s sneaky and quiet usually. I miss it if I’m moving too fast. When I practice slowing down and noticing, the rising is all around me. Springing forth from every nook and cranny of my one precious life. 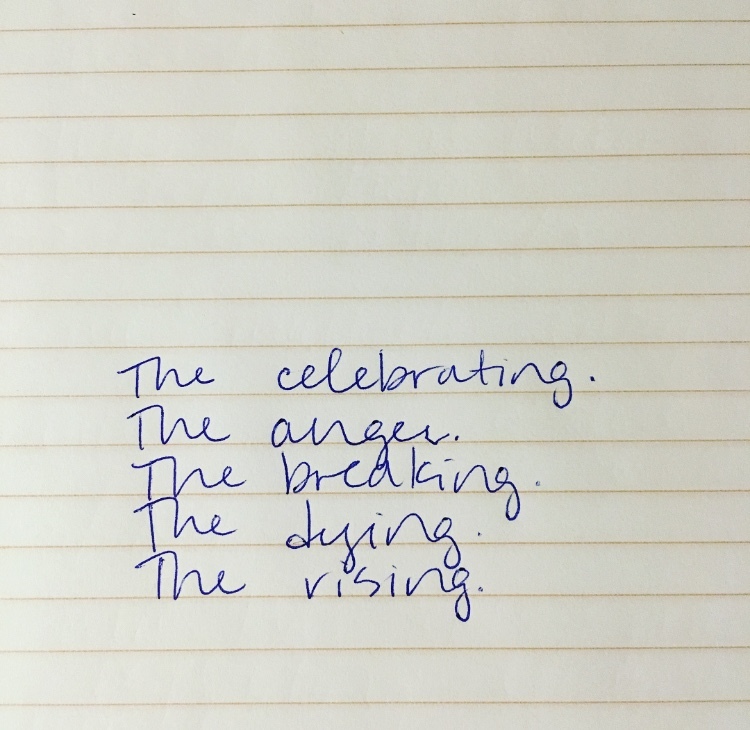 The rising is here. So maybe Holy Week isn’t just about a week in March or April each year. Maybe it’s not all about bread, wine, thorns, blood, bonfires, tears, bunnies, eggs, Starburst jelly beans, Peeps, Cadbury eggs and Easter dresses. Holy Week is the rhythm of a follower of Jesus. We can incarnate the rhythm of Holy Week and it become so familiar and close. In some ways, we don’t need a special week to think about it. Holy Week is what we breathe every day. This is the way of Jesus. And I continue to be surprised how breathtakingly beautiful this rhythm can become. One day you realize, the story is exactly what you never knew you needed. The story of Holy Week doesn’t need the hype. It’s your everyday life. Next How do you measure your days?